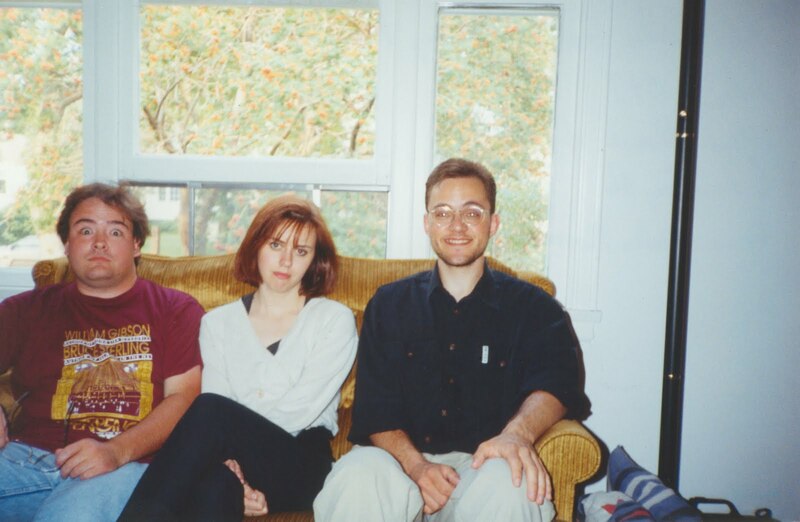 Earl, Ron and Ron's future wife Joanne relaxing in the Ron Room at the Bleak House of Blahs, July 1993. For once, we decided to cook. With recipe and ingredients all carefully arranged, Ron and I concocted a batch of delicious chicken pasta in an elegant white sauce. No longer would the bachelor denizens of the Bleak House of Blahs - unemployed Allan, Bag-Boy Ron and Truck-Drivin' Earl - subsist upon tepid take-out; from now on, we would emulate our friends Jeff and Susan and cook for ourselves. It couldn't have turned out better. The pasta was tender, the chicken succulent, the sauce savory. We'd made only one mistake; we cooked too much. No problem, we thought. We put the leftovers in a Tupperware container, tossed that container into the fridge, and went about with our business. At the time, none of us understood that even in the fridge, food doesn't keep forever. It seemed natural to assume that once sealed in an airtight container, our pasta would remain fresh for months, perhaps years. So when Ron and I found ourselves alone in the house with nearly-bare cupboards several months later, we decided to heat up our leftover pasta. I watched Ron reach into the fridge and retrieve the container. I remember clearly how ordinary the day seemed; the chill of the January air, the cool natural sunlight that filled the kitchen, the piles of dishes arrayed sloppily on the counter. I was completely unprepared for what was to come. Ron peeled the Tupperware lid back slightly, breaking the seal. A calamitous stench immediately filled the kitchen, an odor so vile it had physical presence, oppressive, dank, bitter. The stench invaded our nostrils, our ears, it oozed over our bare skin, sank tendrils of putrefaction down our throats, through our hair. Tears sprang from our eyes and we cried out, staggering, panicking. "WHAT THE HELL!" Ron shrieked raggedly. I gagged, waving my arms uselessly. I couldn't breathe. I felt as though I might pass out. Maybe it was his Safeway bag-boy training. Perhaps it was his years hunched over 80s arcade games. Or maybe it was just plain heroism, bubbling up like a life preserver at just the right moment. Whatever the reason, Ron regathered his wits and sprang into action. As I sank helplessly to my knees, I watched Ron dash blindly for the back door. He crashed through it with a banshee cry, flinging the deadly pasta like a discus. The dish hurtled through the chill winter air and buried itself deep into a snowbank. Ron had snapped the lid shut on Pandora's Box just in the nick of time. Once the air cleared, Ron and I recovered, wiping our eyes, shaking our heads in disbelief at our narrow escape. "Why did that happen?" One of us asked. "I don't know...how long can you keep pasta in the fridge?" another answered. "I guess it's less than three months," we realized. Almost twenty years later, I've finally come up with the perfect way to summarize our adventure: that pasta really reeked havoc.